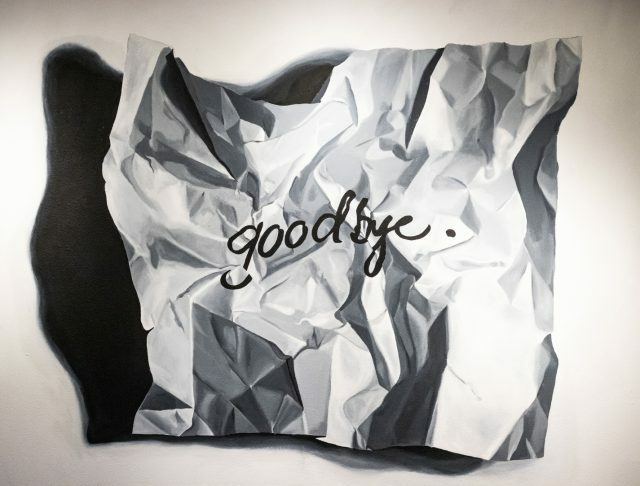 Student artists, inspired by social media and personal experiences, have taken over four walls of the Lakeview Gallery. 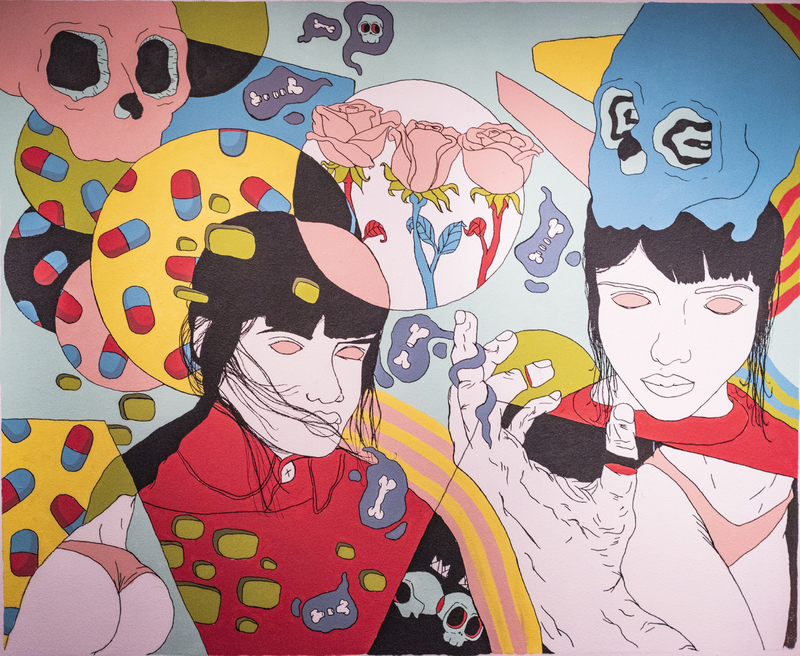 Quattro, an art exhibit that features four student artists each year, is on display on NW. The students were selected out of 25 that submitted proposals during the semester. 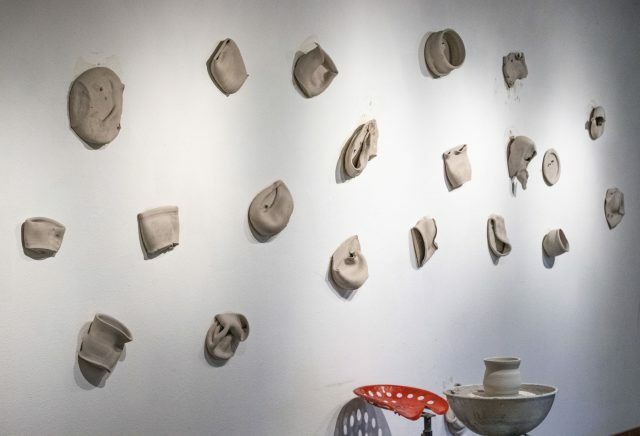 Four faculty jurors chose the top four artists who were then given a budget of no more than $100 and instructed to use a wall to make something that is site-specific and large scale, said NW art associate professor John Hartley, who created the event seven years ago. “Sometimes we get things that are 3D. Sometimes it’s more decorative or political,” Hartley said, adding that this year the jurors received more political submissions than in previous years. This year’s show features works from NW students Mario De La Cruz, Mariangelis Pagan Marcano, Thomas Peppers and Humna Raza. De La Cruz said he was inspired by social media, pop culture and advertising and that his work is a commentary on what the younger generations consume on a daily basis. He created a 12 feet by 8 feet mixed media installation named Pheno Six. “It was heartbreaking having to move away and leave her because my house in Puerto Rico was uninhabitable,” Marcano said. On the wall also sits a crumpled note with the word “goodbye,” which is a final farewell to her grandmother. The third artist, Peppers, utilized a different medium than his peers: clay. He threw pots on a vintage wheel made in 1972 before attaching them dry to the wall. “It gives a little bit of personal satisfaction to throw a pot against the wall,” Peppers said. The fourth and final wall was created by Raza. 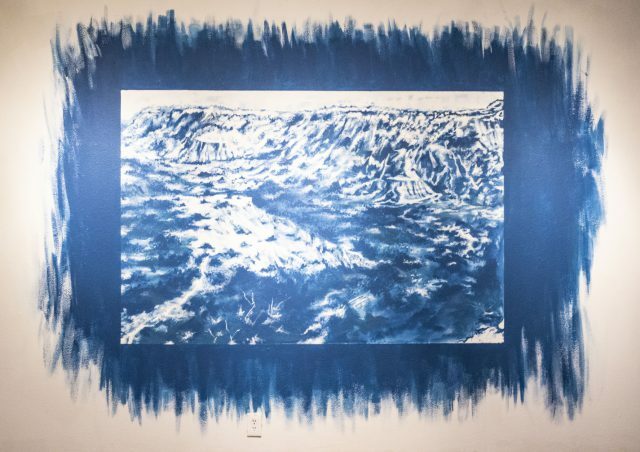 It has a recreation of a photographic blueprint of Palo Duro Canyon, titled Cliffside in Cyanotype, which portrays the immensity of the canyon while showing the aesthetic quality and richness of a traditional Cyanotype. Quattro is on display during regular campus hours until Jan. 20, 2019. A reception where artists will talk about their pieces is 11:30-2 p.m. Dec. 4 in the Lakeview Gallery.